Yesterday I had the opportunity to go out and look for butterflies; it was one of the first spring-days here in the Netherlands(It was colder in the first months of this year. I saw 2 peacock butterflies , one comma butterfly and 3 small whites and a small tortoiseshell. This is one of the pictures I made yesterday of a peacock butterfly. ( Inachis io on lamium purpureum / Dagpauwoog op paarse dovenetel / Tagpfauenauge auf Purpurrote Taubnesse / �pine noire au Lamier pourpre. The Peacock (Inachis io) is a well-known colourful butterfly, found in temperate Europe and Asia. It is the only member of the genus Inachis. The species is resident in much of its range, often wintering in buildings or trees. It therefore often appears quite early in spring. The butterfly measures about 5 cm (2 in) from wingtip to wingtip and is easily identified by its striking eye pattern on a ruddy background, although with wings closed the cryptically coloured underwings make it look like a dead leaf. The eyespots are reminiscent of those on the feathers of the peacock, hence the name. They are believed to be used to frighten predators (such as birds) by creating a false perception of another predator (note how a glance at the image can give the impression of a cat staring). The butterfly hibernates over winter before laying its eggs in early spring, in batches of up to 500 at a time. The caterpillars, which are shiny black with six rows of barbed spikes and a series of white dots on each segment, hatch after about a week and feed on nettles and hops. The adult butterflies drink nectar from a wide variety of flowering plants, including buddleia, sallows, dandelions, wild marjoram, danewort, hemp agrimony, and clover; they also utilize tree sap and rotten fruit. The Peacock can be found in woods, fields, meadows, pastures, parks, and gardens, and from lowlands up to 8,200 feet elevation. 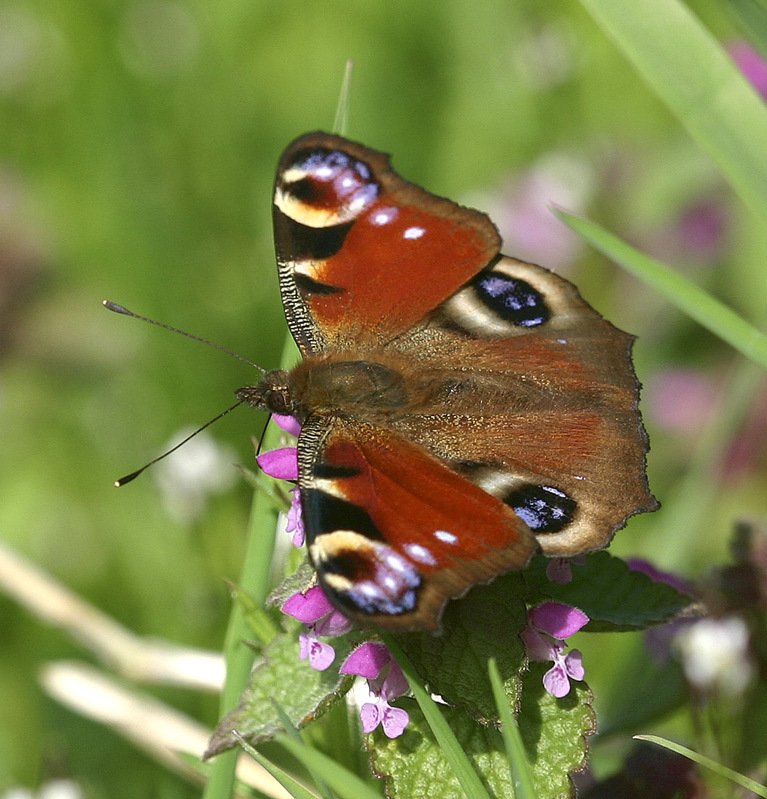 It is the commonest butterfly seen in parks and gardens in Europe. Very good photo of this beautiful Nymphalidae! Very good POV and details! Also a very good DOF! Perfectly focussed, with enough depth of field to cover the whole area of wings in sufficient sharpness at this rather difficult to take pose. That butterfly is in remarkable good shape for the time of the year taken - that means it must be several months old and has survived hibernation. A great capture! Colours are fabulous and the focus really sharp. I like the composition too. Well done & TFS.